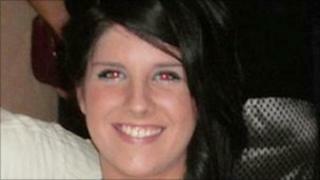 A taxi driver has been charged with the murder of 22-year-old Sian O'Callaghan. Christopher Halliwell, 47, was arrested on Thursday before Miss O'Callaghan's body was found near Uffington, Oxfordshire. Police said bones recovered during a search in Gloucestershire were believed to be of another woman estimated to be aged between 23 and 30. Miss O'Callaghan had not been seen since leaving a nightclub in Swindon early on Saturday 19 March. Mr Halliwell, of Ashbury Avenue, Swindon, was charged with murdering Miss O'Callaghan on Saturday evening and is due to appear before Swindon magistrates on Monday. Police had been digging on Baxter's Farm at Eastleach in the Gloucestershire Cotswolds 17 miles from where Miss O'Callaghan's body was discovered, since late on Thursday. On Saturday they revealed they had found human remains but said they had yet to identify them. Det Supt Steve Fulcher of Wiltshire Police, who is leading the investigation, said on Sunday forensic laboratory tests and a post-mortem examination would be carried out on the bones. Det Supt Fulcher said it had been indicated to him that the woman was taken from the Swindon area between 2003 and 2005. District Crown Prosecutor Simon Brenchley said: "I have been working closely with Wiltshire Police and now have authorised them to charge Christopher Halliwell with Sian O'Callaghan's murder. "Having reviewed the evidence, I am satisfied that there is sufficient to charge him, and that it is in the public interest to do so. Mr Halliwell remains in police custody at Gablecross Police Station in Swindon. Det Supt Fulcher appealed for anyone who had been "lamping" or poaching in the Ramsbury area of Wiltshire or nearby from 0300 BST on Saturday 19 March to contact the force if they had seen anything suspicious, or a green Toyota Avensis. He stressed officers were not interested in prosecuting anyone for poaching. Hundreds of Chinese lanterns and balloons were launched into the sky on Saturday evening during an event in Swindon in memory of Miss O'Callaghan. Thousands of people gathered at the town's Polo Ground for a two-minute silence. Team mates also stood in silence on Saturday afternoon at the club where she played bowls.